Description: CP 252 heads south. Description: CSXT Northbound Freight Train Q518-05 ( Montgomery, Al. to Nashville, Tn. ) passing through Birmingham, Al. Now Q518 originates in Birmingham, Al. running to Nashville, Tn. Description: CP train #498 passes by Bangor this sunny Saturday morning. Description: This eastbound CP train would have to wait for three westbounds. 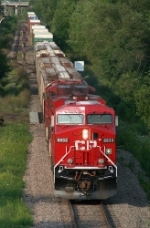 Description: The CP train gets the green light to enter the single track. Title: CP 243 at Mile 108 Galt Sub. Description: A US visitor helping 243. Description: CSX 7560 helping out.